Customising your SportsGiving page allows you to tell people your story, what your fundraising target is, personalise thank you messages and an option to add a photo. This is also where you can log offline donations so that they are added to your total. If you have deleted or can't find your SportsGiving email, see the instructions below for another way to find your fundraising page. When you are happy with your page click the ‘ Update your Profile ‘button and your SportsGiving page will be updated immediately. And remember you can also share your page on social media, see "Share this page" option on right side of your sponsorship page. 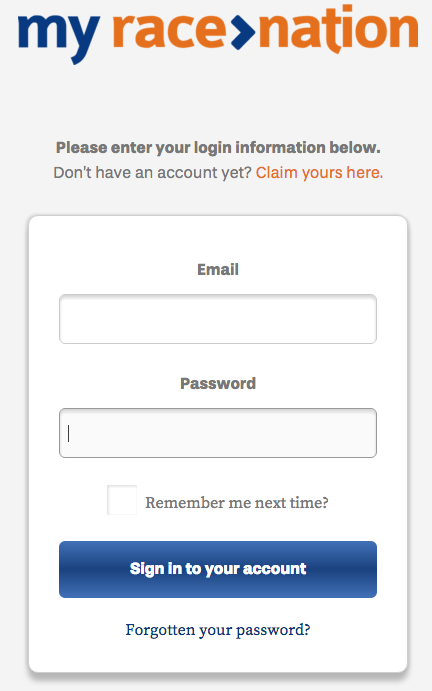 If you have accidentally deleted your SportsGiving email, you can still find your page by logging into your MyRaceNation account. Head to www.my.race-nation.com/login and enter your login details. 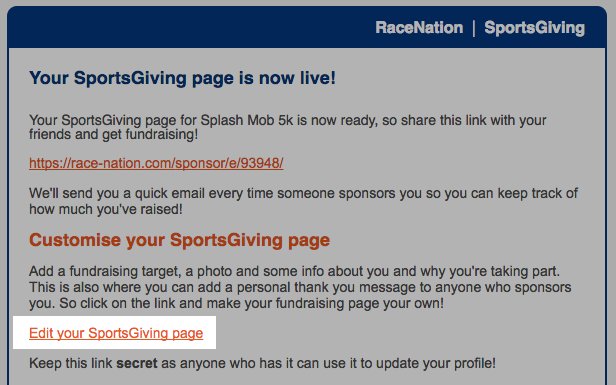 Click on Customise Sponsorship Page and this will open your “Your Sports Giving profile” page where you can scroll down to the relevant section and add the desired text.